The Enabler | Musings on branding, enablement, engagement, communications, typography and the occasional show, theatre and restaurant reviews. All postings are personal perspectives. Musings on branding, enablement, engagement, communications, typography and the occasional show, theatre and restaurant reviews. All postings are personal perspectives. A few weeks ago I attended ‘field.work‘ an event arranged by Havas who’ve just published some of the keynotes and breakout sessions. Nathalie Miebach spoke at the event, an artist who “translates science data into sculpture, installation and musical scores”. Here’s one of Nathalie’s sculptures. 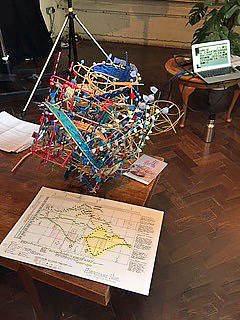 A sculpture by Nathalie Miebach based on weather data. At first look I found this an impenetrable ball of wires and flags — not a sculpture I’d necessarily want to display and admire (and definitely not dust!). However, when Nathalie started to talk through the data points that she’d used, and how she’d constructed the sculpture piece by piece, it took on new meaning. Natalie starts to build her sculptures using a timeline basis – imagine a clock face representing duration as the foundations. From there, she takes other data such as high tides, low tides, peak and trough temperatures etc. and builds these out from the timeline to create a 3D object. What I found most interesting was that in a 3D object, the anomalies were far more evident than they were within the report she was using as the basis, they literally ‘stood out’ (or sank back). Much of our earliest learning is by ‘doing’ rather than sitting, listening and transcribing. As we grow up, the opportunities for this ‘kinesthetic learning’ tend to decline as we lean towards written and spoken communication. This is certainly the case in the corporate world – the interpretation of ‘big data’ and analytics is primarily through spreadsheets, reports, dashboards etc. Nathalie’s approach suggests that there are other ways of (quite literally) modelling data – that can provide immediate insight rather than picking out trends and anomalies amongst seas of numbers – data realisation rather than visualisation. Are experts needed for interpretation? Having an object that needs an expert/creator to provide context in order to understand it, is not ideal, however even with a small amount of unaided effort inspecting the object – the anomalies in the weather data were evident. As a method of serving up data I think Nathalie’s data sculptures are an interesting approach to providing insight and I wonder how 3D printing might be used to build models of data in a similar way. Extending the notion of 3D printing to interpret ‘big data’, Nathalie’s data sculptures feel like an intersection between the ‘maker movement‘ with its strong focus on using and learning practical skills and applying them to reference designs, and the world of big data and analytics – a new approach to data insight that provides, quite literally, tangible results. The story trend: are you bored of bad ones? From brand journalism to in-bound marketing – we’re all encouraged to use story to engage our audiences – but what makes for a good story and even more, for a good writer? Years ago, a friend recommended Robert McKee’s ‘Story Substance, Structure, Style and the Principles of Screenwriting‘. I’d eagerly raced out and bought a copy, and tried to get into it, but at the time, I lost momentum and it sat patiently on my bookshelf — until a few weeks ago. It must have known that it’s time would come as it’s now proudly sporting a number of hand written annotations and several cracks in its spine and from over use! Why have I found it so useful? Being a visual thinker – and also wanting to learn Prezi with a ‘real’ project – I decided to create my first Prezi to try and represent Robert McKee’s thoughts on both the structure of story (acts, scenes and sequences) and the techniques of writing (the ‘quest’, ‘writing between gaps’, ‘turning points’ etc.) – and here’s the outcome:. I’ve only scratched the surface of Robert McKee’s book – I’d encourage you to have a read – it’s a great help in understanding why some stories work better than others. Story is like creating a symphony, you need to learn the instruments and how they work in harmony with timing to create great music. It’s not something that’s as easy as picking up a trumpet and blowing – it takes knowledge, understanding and practice, practice, practice. How carefully are you listening to your customers’ needs? ROI needs are loud, functional needs louder, but it’s hearing the quieter emotional needs that pays dividends. This compelling video from the Mimi Foundation in LaHulpe, Belgium is an outstanding example of listening carefully to ‘customers’ and truly hearing their emotional needs. Coupled with that, is a superb creative response captured in the video. These two elements combined are visible in the wide audience it’s captured which you can see by the number of views. The creative has been extended into other touches including photography, gallery showing and a book, an outstanding example of emotionally connecting with an audience to highlight a service. Listen for the emotional need – it may not be the thing most loudly voiced by your audience. Respond to that emotional need with a fitting creative response. Apply the two consistently in supporting touches to drive audience engagement. Google’s two-step is a shining example of the power of story. Google tells a beautiful story connecting the viewer with likable characters and filling in historic background that lends itself to authenticity. Perhaps less obvious, and deftly pointed out by Himanshu Gupta in his blog on Medium, is why Google have released this advert in a market where they have 97% share. Google are aware of the speed of mobile adoption, particularly in India – watch the advert a second time and look for the early move of search from the desktop to mobile; how mobile is used first in the home and then traveling to demonstrate location specific search, along with responses in ‘cards’ – these reflect Google’s eagerness to encourage seekers away from native apps that offer similar features. I was fortunate to attend a Google/Mindshare event earlier this year, where ever more sophisticated searches are met using location aware and ‘previous question asked’ sensitive responses (more on that in my previous blog here), all enabling us to create our own stories like the one in the advert. repeat viewings can reveal the more subtle messages and purpose. What if your mother ship’s digital? How to build corporate culture for virtual employees. Providing a clear sense of ‘home’ where your employees feel they belong is the start, the next is embedding your brand to build your corporate culture by making sure your ‘medium is the message’. Your intranet should have a clear ‘look and feel’ of your brand, have a tone of voice that sounds like your brand and functions in line with your values. This will help your digital brand to ‘feel like home’ for your virtual employees. Angela Ahrdents talks about the importance of entrances and the organisation of the floors of the offices reflecting importance within the company with design at the top supported by merchandising and then marketing. In the digital world, this is your site navigation – think about having your strategy as your ‘home page’ where all employees see the same messages – then arrange your navigation to reflect your organisation structure. In offices, it’s easier to design gathering points to ‘keep the energy flowing’, in a digital environment, this needs to come from web meetings, ‘face to face’ meetings (think Google Hangouts and Skype calls), and profiles that can be personalised and which facilitate employees finding each other, building networks and engaging. 3. There are no satellite offices. Each of the Burberry offices is designed to look like an extension of each other. Consistency is key in brand building to help employees “feel the brand” wherever they touch it – and the digital space / intranet is no different to a physical office. Every employee needs to access one intranet where the experience is consistent no matter where in the world they are, what department they work in or what task they’re trying to achieve. Your intranet ‘home page’ is your virtual home – build your digital environment to mirror a physical environment in a way that looks like, sounds like, performs like and ‘is’ your brand. Keep the energy flowing in your intranet – design meeting places and personalisation enables employees to build a sense of belonging and to find and engage with each other. Consistency is key – every employee needs to have the same experience to feel equally at home. How at home are you in your digital work environment? If you have corporate offices, is the experience the same – or does it differ? 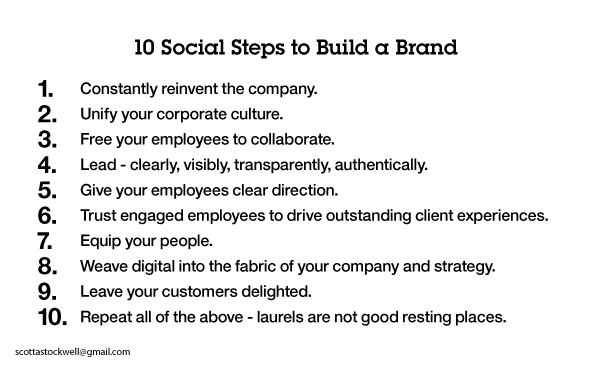 10 social steps to build a brand – what Angela Ahrendts’ move from Burberry to Apple can teach us. On 15 October Angela Ahrendts moved from CEO, Burberry to SVP Retail and Online Stores, Apple. This Burberry’s Social Story video for SalesForce neatly picks out the ten steps in Burberry’s digital strategy which have made the brand so successful, and signal what we might look for in Apple retail soon. It all started with an appreciation of the need to constantly change to stay ahead of the fast moving digital curve. People are the lifeblood of any organisation and when they’re aligned around a common culture, they become a powerful force. Ahrendts mentions that the first digital platform that Burberry implemented was “The greatest uniter of culture of any platform that had been put in place”. The common platform brought the employees together because it let 11,000 associates around the world talk to each other – enabling dialogue unlocks the energy within the organisation – best practices can be shared, ideas can evolve, collaboration can flourish, stories can be told. The platform also provided employees direct access to the Leadership Team. The Leadership Team in turn were able to provide real time communication and strategic direction to the workforce – Arhendts and Bailey spoke to their associates directly once or twice a week. Knowing that employees had to be on board first, and having put that in place, Burberry then turned their united employees’ focus towards their customers. 11,000 employees are enabled to respond near instantly to customer interactions in the digital space – a superior level of customer service. Digital elements are added to the physical shopping experience, tags in garments trigger video mirrors, and trays tell stories of the provenance of products placed on them, Burberry’s flagship retail store in Regents Street, London, England is more an adult retail theme park than a department store. Go back to step 1 and keep reinventing yourself at the speed of social. I wonder how long it will be before the we see the first signs of an Apple make-over? 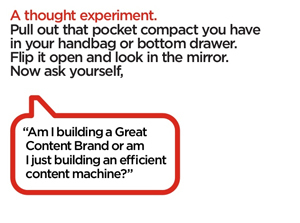 Are you building a great content brand, or just an efficient content machine? Great content gets picked up, reworked, and occasionally ‘spoofed’ in recognition – this excellent SlideShare asks if you’re building that great content, or if you’re just an efficient content machine. Grab a coffee, settle down and flick through this really entertaining SlideShare on content marketing if you’re in any way involved in content creation, I think you’ll find it’s well worth a few moments of your time – there are some great pointers inside. This got me to thinking what great content marketing grabs my attention – and the latest for me has been “Old Spice Australia and New Zealand” with the strap line “In Australia, the men are manly, now they can smell like me”. It’s a great ‘take’ on an already extremely successful advertising campaign for Old Spice, which has spawned a number of ‘spoofs’ including an excellent Muppet version ‘Now you can smell like a monster‘. Great content tends to get picked up, reworked, ‘spoofed’, and ultimately amplifies the original content. You could argue that the above are commercials – a particular category of content. The Dove ‘Real Beauty’ Campaign, Fridge Raiders ‘Meat Hat’ and O2’s Gurus, are some other great content examples that aren’t traditional commercials, but build their brands – I’ve written more about those in my blog on getting the best out of YouTube. What great content brands have caught your eye lately – and how have they informed your work? Last Thursday, I popped in to Google@MindShare’s ‘Connectivity Creates…’, to hear why timing is everything, authenticity is crucial and tried out Google Glass – amongst a host of other topics, all related to digital creativity and audience engagement. The BAFTA reception area was laid out with turf and shrubbery, giant flowers and trees, all below a cloud filled blue sky and with a resplendent Google logo spread across an entire wall. The delegates arrived, dropped damp coats and umbrellas with the coat check and after a revitalising coffee we headed into BAFTA’s large screening theatre to hear some of Google’s folk share their thoughts and give us a peek into some of the things coming our way. Could employees be their clients and customers? Mark Howe, Manging Director Agencies, (NACE) talked about the way that advertising was extending to take advantage of second and third screens using an example of Top Shop where viewers can interact and “be the buyers” using Google+ Hang Outs and an app – which made me wonder what organisations could do if they took a similar stance to “be their clients” and enabled their employees to compare their perspectives interactively – what different views of client and customer opportunities they might unearth. Mark also talked about timing and making sure to create experiences by aligning broadcast with emails or ads that would show at the time that programs when relevant content was running. An old adage perhaps, but “timing is everything”! Harry Davies, Lead Product Marketing Manager, Large Customer Marketing talked about “New Moments” and used an example of researching the purchase of a tablet across various devices that many of us now own, to the point where Google maps gave him a route not only up to the front door of the store, but with their internal ‘street view’ up 5 floors in a lift, and across the floor to the stand where the product could be found. He also demonstrated some web contact cards where a button could be pressed to get in touch with him – but only during the hours he’d specified. It struck me this was a bit like Commissioner Gordon’s Bat Phone – when he needed help, the number was right at hand and Bat Man at the other end – really useful for customers to get help, and employees to surface expertise in a flash. Mike Warriner, Engineering Director, Google demonstrated some really exciting ‘context’ search in Google. He searched on ‘Lincoln’ to be presented with the US President, the town in the UK and a car. Narrowing this to the president by clicking a picture of President Lincoln, he got more of the information he wanted. His next question into the search bar was “who is the current president?” and the search remembered his previous query, assumed the context was the United States and returned Barack Obama as the top result. The next search was “what is his wife’s name?” and again, rather than searching on just the words, it returned Michelle Obama, and there were a couple more queries down a similar path. Hamish Nicklin, Head of YouTube and Creative Agency, Google and YouTube Partner – Ruth Crilly: A Model Recommends then talked about the nature of YouTube, and that if we look at this only as another platform to place our TV ad’s, we’re guilty of ‘skeuomphism‘ (in a nutshell, something modern that retains design elements of it’s predecessor but which are no longer needed and so only decorative – such as rivets on a crockery pot that’s been modelled on a metal pot). Ruth gave some great examples of the difference between a blogger’s content and brand developed content and focused on viewpoints and perspectives. Ruth found that her content worked best when she was on location, and captured content when she was speaking with experts in the field, and that when she videoed herself reflecting on this afterwards, the engagement dropped significantly. Ruth hammered home how pivotal ‘authenticity’ is – that honest, consistent opinions are crucial to building and sustaining viewer engagement, and that a brand push stands out like a sore thumb, but that a genuine review of a brand can come across really well, provided that brand is credible in the blogger’s world and to their audience. Campaigners – who take offline content and make it relevant on-line, citing Dove’s Beauty Sketches‘ as an excellent example of taking a brilliant concept of ‘revealing real beauty’ to life on-line in a way that could never have worked as a TV advert (highly recommended viewing if you’ve not seen this extremely popular video already – prepare to be moved!). Collabroators – who involved their audience in engaging ways. Hamish used an example of gamers who were encouraged to invent meat dispensing hats for ‘Fridge Raiders‘ snacks – with some hysterical results. Channels – where brands move into brandcasting, and Hamish used O2 Guru’s as an example, where help tips are filmed and broadcast to assist cell phone users to solve technical issues (building brand loyalty whilst reducing visits to O2 stores and calls to help lines). The sessions closed with David Bruno, Senior Creative, and Joao Wilbert, Senior Creative Technologist both at Google Creative Labs, London. They showcased a number of examples of work that looked at encouraging the use of Chrome to sync phones to tablets and laptops with an interactive game called SuperSyncSports, and Google’s take on a Jam that brings musicians together on-line to create music with JamWithChrome. They also talked about Chrome Web Lab, a collaboration with London’s Science Museum, to open up a physical exhibit digitally to build on viewer interactions (sadly, now closed). Each of these was built from a one line summary of what the project aimed to achieve, that was then sketched out, prototyped and brought to life – all under the auspices that you have to try things knowing that failure will help you improve them. The morning concluded and back in the reception area we had the chance to try out Google Glass which was amazing! In the morning when Harry had demonstrated the way that Maps was developing and Mike had talked about context and geo location driving search, Glass brought much of this together. The glasses are brought to life with a tilt of the head or by saying “ok glass” and a small screen in your peripheral vision pops up with a menu that you move either by looking up and down at it, or by tapping on the stem of the glasses. You can have it shoot video, take a picture – and share those instantly – you can get directions, see pictures of where you’re going – much of what you can do with Google Voice today, but by talking at a tiny screen. What I hadn’t appreciated until afterwards is that there’s no ear bud that you pop in, you hear the voice through the side of your head where the arm of the glasses rests. Corporate stories – where’s the drama? Good stories have drama and drama comes to life in the action between characters. If the last corporate story you read was more fact sheet than blockbuster it was likely missing the vital personalities and perspectives needed to elevate it beyond corporate reflection. There’s a tendency to take on ‘reporter voice’, mimic the intonation, build the same peaks and troughs of speech, and in the process your own voice gets lost. Audiences like individuals, and the more you put of yourself into your piece, the more you’ll give them to connect with. Corporate ‘tone of voice’ or your own? This rings true in the corporate world where there’s often a ‘house style’ or a corporate ‘tone of voice’. This works great for official communications like annual reports, thought leadership pieces, white papers and fact sheets, but when it comes to story telling, it’s your personal perspectives that create the engagement. If you report the facts alone, you’ll sounds like a fact sheet. If you only provide your opinion, you’ll come across as self-absorbed and the purpose of your story will get lost. You need to find a balance between these two to engage your audience and deliver the purpose of your story. Ira reflects that even if you’re producing a first person story documenting experience, what’s interesting is not just your take on things, it’s seeing how you interact with other people; seeing other people through your eyes seeing what you deal with – otherwise there’s no drama. You need all the things that happen between people. It’s not going to work if there’s too much of you and not enough of the other people, and it’s not going to work if there’s too much of the other people and not enough of you, because there’s not enough characters to make a drama. How do you balance corporate reporting and personal perspectives? Think about your last corporate story – how much was setting the scene, reporting the facts and concluding with the outcome? Did you mention how you felt? Did you recall your interactions with anyone else? If you’re not including other characters and creating some drama, you’re not really telling a story, you’re just recalling an experience. Don’t lose your own voice amidst the corporate house style – one size does not fit all communications. Good stories have drama, drama needs action, and action needs characters – ensure your stories have the drama that creates the engagement. Balance your content between your subject and your perspective, all subject will read like a fact sheet, all perspective will sound like a soliloquy, both approaches will lessen your reader’s attention. Think about the last corporate story you read – on a scale of ‘corporate fact sheet and business blockbuster’ where did it sit? 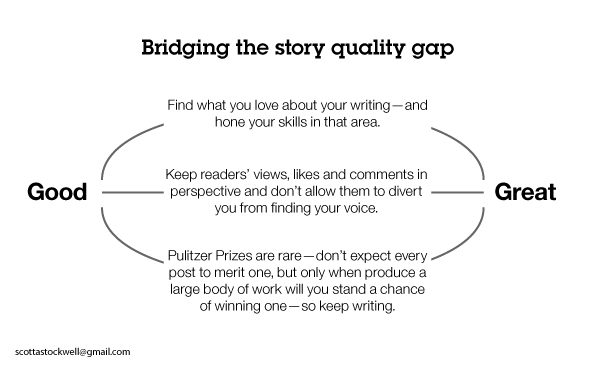 How to bridge the gap from good to great corporate stories. Not every corporate story you write will merit a Pulitzer, but focusing on what you love in your writing, producing in volume and not letting reader stats distract you from your course will steer you towards your best work. Following my last blog on balancing time between story selection and story production, inspired by a series of four short videos by Ira Glass, in Part 3 – On Good Taste Ira observes that you get into something because you love it, you have taste, but to expect that for a lot of your early work, your output won’t match your ambition or reflect your taste very often. But you’ll know that gap – and you must continue to produce and the quality will come. 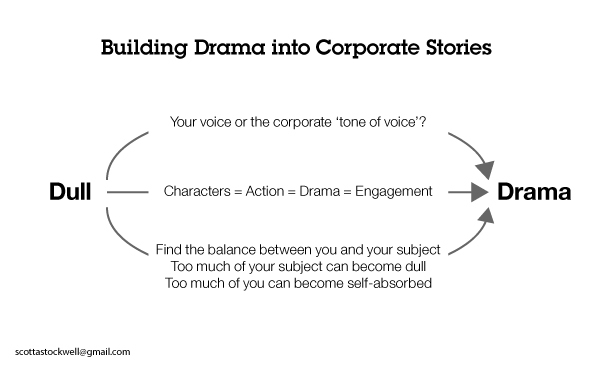 In corporate story telling, you may have limited choice on your content, your medium or your writing deadlines. Try to find an element that you love, and hone your story telling skills around that. It might be your ‘voice’, it might be the format you work in, it might be a content specialism. Try to identify the essence of what you enjoy in your writing – and your reader will likely ‘hear’ that too. Views and likes are great, comments are better, but keep them in context and critique your own work. Look at the work of other writers and ask yourself what it is in their writing that appeals to you, and see if you’re using the technique in your own work. One of Ira’s key points is that you mustn’t let your own critical eye dissuade you from writing, it’s only in producing a body of work that you’ll create material that you truly feel reflects you. If you stop at the first hurdle – you’ll never know. Many employees have a sense that everything they write has to be Pulitzer worthy, it makes them nervous, and they dabble only as far as comments and status updates, likes, or don’t join in at all. Take a leap of faith and ‘publish and be damned’. Amongst all of your corporate content and obligations, find what you love in each piece and let that be your focus. Audience feedback is great, but write first for yourself – your audience will appreciate it more. Every article won’t win a Pulitzer – it’s not supposed to – so ‘publish and be damned’. Have you found a foreboding sense of corporate writing perfection has prevented you from publishing or felt constrained to venture only as far as reading, liking and commenting?